Today’s Ghan – the only one for the week – was cancelled and Coles and Woolworths have gone to road freight from the Adelaide Freight Terminal immediately after the derailment of a goods train yesterday, damaging the track just south of the SA-NT border. Says Greg Pauline, Managing Director of Genesee and Wyoming Australia, the owner and operator of the line: “This should see only a 24 hour delay in getting goods to the supermarkets along our rail corridor in Alice Springs, Tennant Creek, Katherine and Darwin. “We have commenced our recovery of the track. About 300 meters has been damaged in the derailment. We believe that we have had a wagon mechanical failure but we do not know for sure yet. 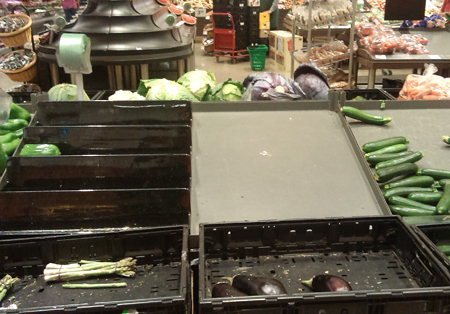 Meanwhile, some supermarket shelves in town are bare. We have sought comment from Woolworths and Coles. Crikey and in the same week we celebrated “back to the future”. Guess this is “Back to the Past”. Derailment was once a common word in the Alice, let’s hope we are not returning to the bad old days where the level of rail maintenance saw derailments every second week, fresh fruit and veg quite often off the shelves.